Gamersdailnews grants a gold award to Shift Extended! Another great review of Shift Extended (available on PSN Mini) has been posted on GamesDailyNews. On top of an extraordinary score (9.5 out of 10) we also got a Gold Award. Nice isn’t it? Firesale – Shift Extended on PSP/PS3 -50%! Today we suggest you turn your brain upside down at half-price! That’s right, we’re launching a special offer for SHIFT extended which can be downloaded in the Minis section of the PlayStation®Store! 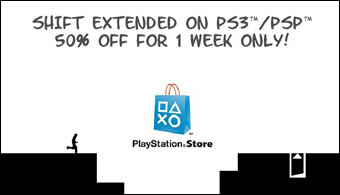 Download SHIFT extended on PlayStation®3 and PSP™ only for €1,99/$1,99 until March 15th! With twice the content from the original version and brand new gameplay mechanics to push the challenge even further, SHIFT extended is the most complete experience of the series! • A unique concept ; press one button and turn the level upside-down to reveal new paths. “This isn’t your average lifeless port, but a new version boasting a few more features for your cash». Download SHIFT extended on PlayStation®3 and PSP™ only for €1,99/$1,99 until March 15th! Shift Extended, a brand new version tailored for the minis and, of course, based on the successful Shift series, is now available on both EU and US PSN stores (available on both PSP and PS3 in the minis). It is available for 3.99$ / 3.99€. It features unique set of levels (160 in total) as well as never seen game mechanics in the Shift series. If you don’t have an iPhone, are addicted to platform games and you have a PS3 or a PSP, this is a must buy! Zallag, our publisher on this game did a great communication job and posted several trailers around the web. Here is the second one!